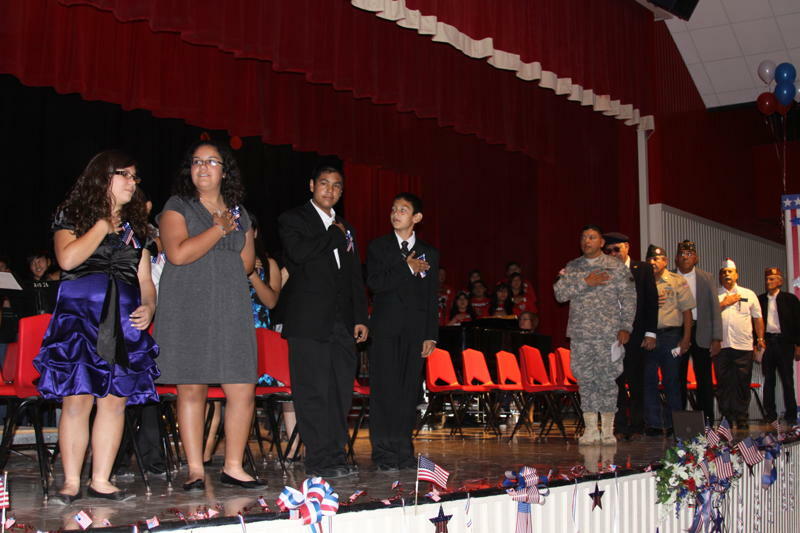 Ringgold Middle School Students recently honored Veterans in the community with a ceremony. The local heroes were recognized at the event including RMS' very own Veterans. The RMS Band and RMS Choir performed a variety of musical numbers. Jacqueline A. Peña-Student Council President served as Mistress of Ceremonies followed by a Welcome by Victoria Smedley. Ashly Lopez who is a Poetry student at RMS recited a poem titled "The Noble and the Brave." This poem praises the work of the soldiers who give so much of themselves as they leave their homes, family and country and and sometimes they do not make it back. The poem ends with the following "So here’s to our country’s heroes; they’re a cut above the rest; let’s give the honor that is due-To our country’s very best." The Guest Speaker for the program was Veteran Jose Manuel Sanchez who is a Government Instructor in Grulla High School. Sanchez spoke of hardships and courage that soldiers endure everyday to insure freedom. He spoke of the pride that he felt as an educator when one of his ex-students he encountered told him that he had enlisted and was also fighting for our freedom. Sanchez recounted the sacrifices that this particular student had made for his country and said that those sacrifices are what hold the key to freedom.